You may know how Octobers in North Carolina can go -- it can be hot as the dickens or blustery cold. I was a little nervous about the puffed sleeves, but we ended up with a very warm day on our hands, perfect for these dresses! 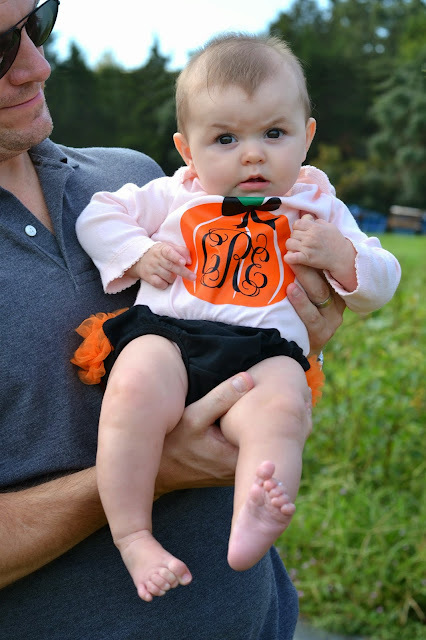 We propped Classic Annie's sweet little Molly Anne up on pumpkins covered by a muslin blanket. But look at these older girls looking at each other. They are like "okay - now what?" Humor me with one more from last year, because I just can't get enough of how adorable she looked. Alright, present day. 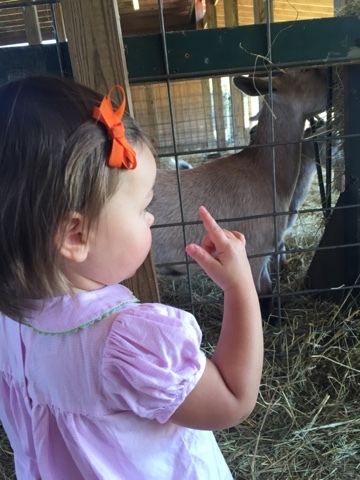 So, our trip to Hunter Farm started with a hayride over to see REAL animals ... Camille was so excited! 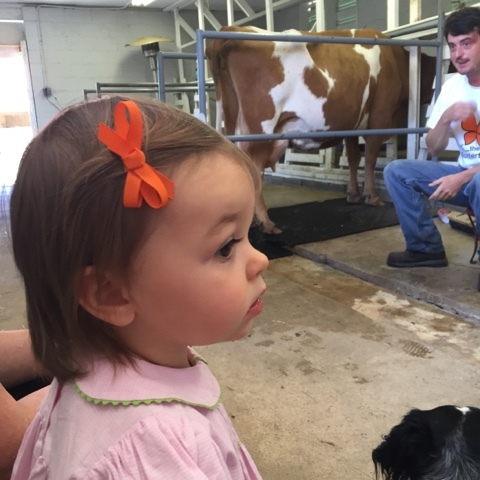 She has been on a big cow kick recently (she says "mawwwwww" instead of MOO), so our first stop to see a cow actually getting milked had us all jazzed. There was also a sweet dog named Alfalfa who Camille loved getting to meet. 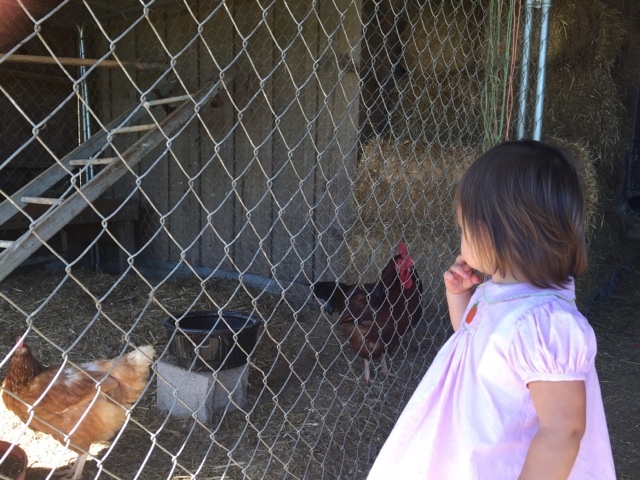 We then went over to the barn where we saw all types of animals -- a calf, goats, sheep, pigs, ducks, roosters, rabbits. 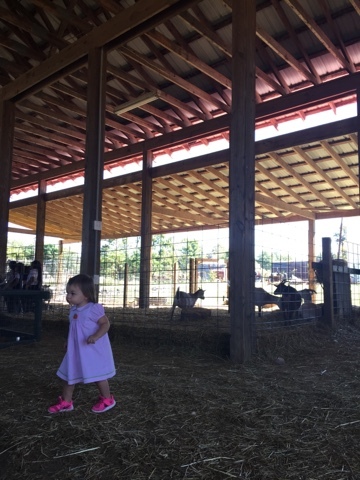 After spending a good amount of time with the animals, we headed back to the hayride to make our way back up to the front of the farm. Our last attempt at an adorable photo of friends was a big fail, so we all headed for our cars with promises of awesome afternoon naps ahead of us. And that we got! 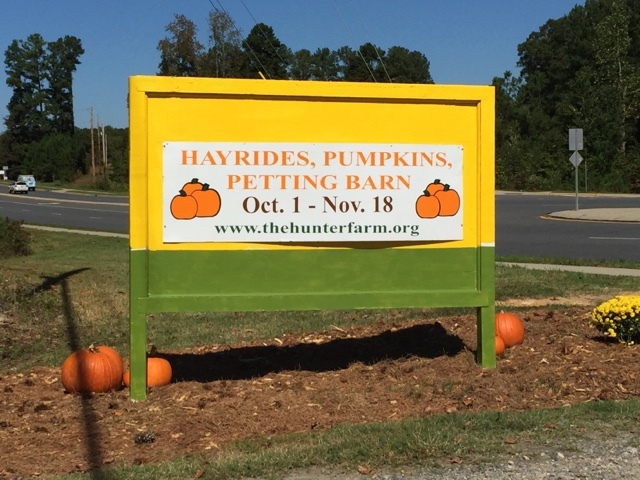 Even though I've visited a different pumpkin patch the past two years, I have to say that The Hunter Farm takes the blue ribbon here. One difference is that my entry was paid, not free -- it was $9.50 (Camille being under 2 got her in at no charge), BUT that included our choice of a small pumpkin to take home. 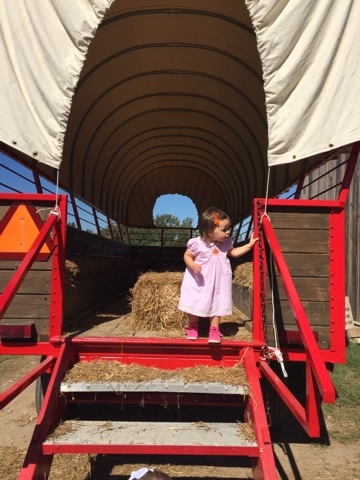 For the pumpkin that now sits on our front stoop and for the amazing experience of the hayride, the chance to talk to farmers, and the opportunity to meet all of those animals, I was so impressed. Definitely worth paying for entry. Plus, the owners were SO friendly. They did mention that weekdays can tend to be busy with school tours until about 1:30 each day, so if you'd like to visit and are looking to avoid the crowds, you may want to shoot for a post-lunch weekday trip. If you are local, you can find out more and check out weekend happenings on their Facebook page. Yay Hunter Farm, I like what you've got going on! 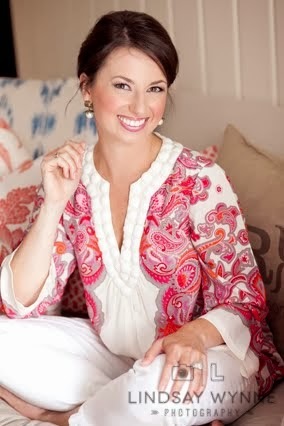 That very same dress was almost headed our way too - love Smocked Auctions:) Camille looks absolutely adorable, and love seeing those photos from last year. She was so tiny! Why do they have to grow so fast!?! That last picture in the basket is the best! So much fun!! And you girls make some really cute girls!! How fun that it is a working farm! I've never heard of it, will have to check it out. The girls are so cute in their matching dresses! Check out Essie's Merino Cool color. It's an awesome grey with purple undertones. Also, keep an eye out, I just scored a Bobeau cardigan this weekend at Marshall's for $20. Camille has so much hair! 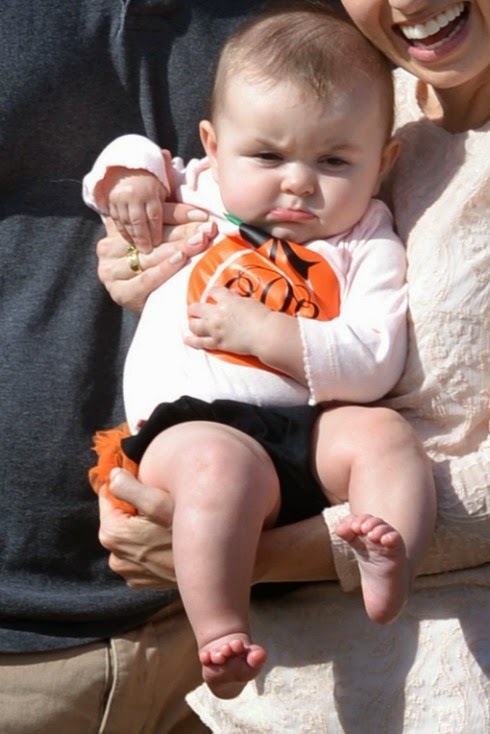 Looks like she enjoyed the pumpkin patch just wasn't into the phony taking! Same story over here! 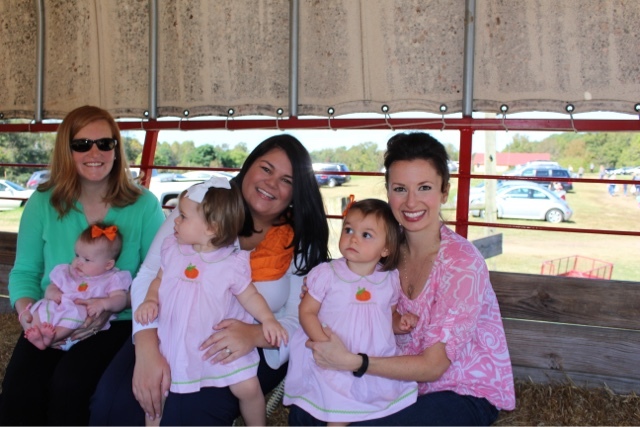 Oh my, the picture of the three babies in the basket is priceless! So sweet! So fun and so adorable! I love a good experience....the holidays will keep getting better and better as she gets older! I think the best photos are the candid ones :) So cute! I used to take my class every year and now we love taking BG. 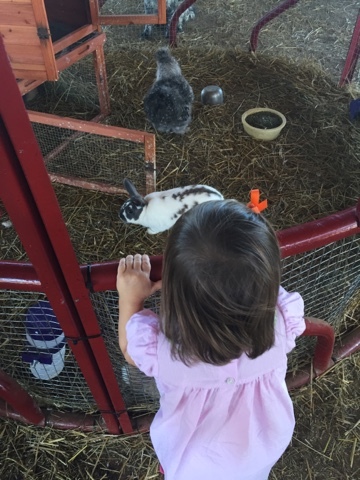 The farm/animal portion definitely takes the cake! I have Been stalking Smocked Auctions FB and Instagram. I love Camille's dress! How fun all three of your lovelies wore the same cute dress. What a fun day! Looks like y'all had the best time! Camille and Gigi could be twins! And of course little Molly Anne is a doll! I'm so glad you reccommended it! We had the best time on Sunday & it is definitely going to be our patch for future trips! How much fun!!! 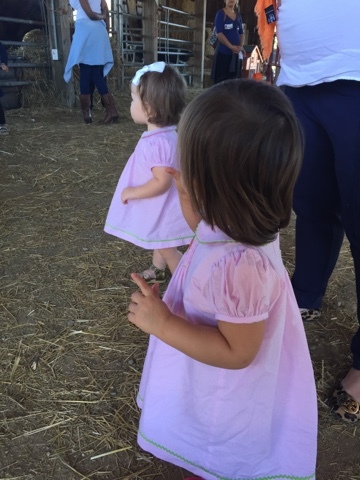 The girls are so adorable in their matching dresses! Looks like an amazing pumpkin patch! Loved this special day with you girls! !